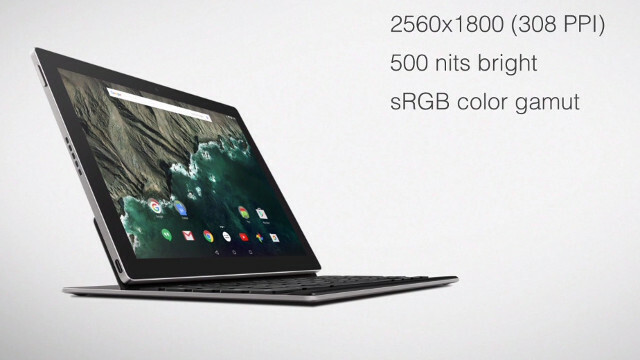 After unveiling this year's Nexus devices, Google surprised everyone with the Pixel C laptop-tablet hybrid. It is basically an Android 6.0 Marshmallow-running tablet with an optional detachable magnetic keyboard. The keyboard connects to the Pixel C via Bluetooth and it is inductively charged by the tablet as well. The Google Pixel C packs a 10.2 inch display of 2,560 x 1,800 resolution. That translates to a pixel density of 308 ppi. The screen is also able to achieve up to 500 nits of brightness, which will make it readable under direct sunlight. Powering the tablet is a quad-core NVIDIA Tegra X1 CPU with a Maxwell GPU and 3GB RAM. It will also be available in 32GB and 64GB of non-expandable storage options. There are also stereo speakers perched on both sides of the tablet. It will come with a USB Type-C port for both charging and I/O. 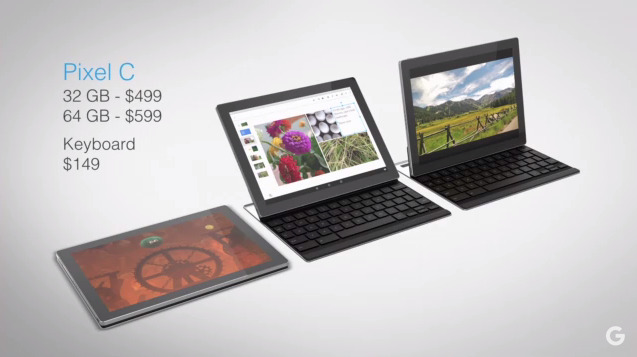 The Pixel C will cost $499 for the 32GB model and $599 for the 64GB one. The keyboard can be purchased separately for $149. Any takers?